Guerlain L’Heure Bleue is the rare fragrance with an undeniable signature. It is sweet and romantic but freakily medicinal, too. It has just as much presence as one of Guerlain’s other singular fragrances, Shalimar. But like the shape-shifting light between day and night, the time for which the fragrance is named, L’Heure Bleue’s mood is less mysterious than Shalimar’s and more magical. In Thierry Wasser’s modern interpretation of L’Heure Bleue, he’s bumped back its eponymous time a few hours and called it L’Heure de Nuit. After smelling L’Heure de Nuit, I would have named it for a cheerful part of the day, a time filled with sun and cake. Maybe L’Heure de Your Coworker Brought In Cookies This Morning. Or, given L’Heure de Nuit’s streak of clean musk, L’Heure de Laundromat. Among L’Heure de Nuit’s notes are bergamot, orange blossom, iris, heliotrope, jasmine, rose, musk and sandalwood. Somehow, the perfume’s components meld to smell like a floral marshmallow dusted with peppery spice and soap. I don’t know much about making perfume, but L’Heure de Nuit smells like it must have been tricky to pull off. Wasser somehow created an unusually plush texture. As L’Heure de Nuit wears, it becomes sweeter and simpler but doesn’t thicken or smell like a dessert buffet. It lasts a good six hours on my skin, a little longer than the L’Heure Bleue Eau de Parfum I’ve been testing it against. The L’Heure Bleue signature in L’Heure de Nuit is unmistakable, but with a few important differences. First, L’Heure de Nuit wafts a good helping of laundry musk. The musk kicks in right away and fades within half an hour. If clean musk repels you, my guess is you won’t be a fan. Also, L’Heure de Nuit’s orange flower is more pronounced, and the fragrance is cleaner with only a hint of L’Heure Bleue’s fine-milled powder. Finally, L’Heure de Nuit shows little of L’Heure Bleue’s aniseed and cedar-tinged drydown. I love how strange, soft, and intelligent L’Heure Bleue is. It’s a moody bombshell in horned-rim glasses. L’Heure de Nuit is also soft, but it wears its glasses with a self-consciousness that strips the fragrance of its wit. L’Heure de Nuit is lighter, prettier, more streamlined, and less freaky than its inspiration. For me, L’Heure de Nuit was fun to smell, but I’d rather wear L’Heure Bleue any time, hands down. For a L’Heure Bleue homage, I prefer Parfums de Nicolaï Sacrebleu with its pulpy fruit and incense. If you’re attracted to L’Heure Bleue but find it too strange, do try L’Heure de Nuit. You’d better have a full wallet, though. Given its price ($270 for a 125 ml bottle of Eau de Parfum), I’m surprised L’Heure de Nuit seems so clearly targeted to a younger market. 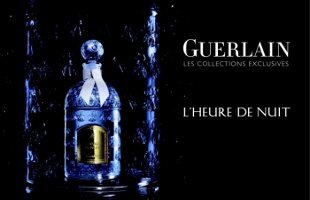 Guerlain L’Heure de Nuit Eau de Parfum is part of Guerlain's Les Parisiennes series and is available in Guerlain boutiques and at Neiman Marcus. Thank you Angela for your insightful thoughts on L’Heure de Nuit! I’m still going to give it a test driving with a sample I should get shortly. I have a lot of respect for L’Heure Bleue and I love the perfume which kind of makes me have high expectations for L’Heure de Nuit but I try not to think about it. I want to keep my mind clear without any prejudice so that I can have a good look into the scent. Thank you Angela. I try to get that attitude whenever I have something new to smell. I don’t want the perfume to be affected by what I read, heard etc. A very *nice* review, Angela. Since I already left a curmudgeonly remark on the post when this was announced, I’ll refrain now. Suffice it to say that a dollop of white musk never improved anything in my opinion. I love the original (wearing it today!) and I do worry about the direction – or lack thereof – of such a venerable old house. The musk was the killer for me in this one, too. It can’t be easy to create a flanker for such an icon, but I think of Eau Premiere, and I realize it can be done. I don’t worry about Guerlain in the sense that the Deserts du Orients were so fabu. Also, so much innovation with their marketing lately. BUT there’s some real weirdness in terms of where they think the general public’s tastes are. Even the mainstream Guerlain offerings are worth a sniff. Insolence and L’Instant for Men were both terrific, in my opinion. I’m less of a fan of Idylle, but it wasn’t awful. Angela I should have said earlier, this is a nice review. Critical AND forgiving. And you’re right about the name. QUESTION: A neo-powdery note like midway between the one in Kenzo Flower and Flower Essentielle was the deal breaker for me. Can someone with some chemical knowledge here tell me, is it hedione in combination with helional? To me it smells like baking soda tastes, also smells sweet, of salt, aluminum, milk, communicating both powder and the texture of clotted cheese. (It’s also in Guerlain’s London, backing the rose note, but not as beastly as it does here.) What IS it? I have zero knowledge of these things, so I’ll leave your question for people who know what they’re talking about. Could it be heliotropin? That is in the original and I think they’ve used it here, although not as strongly as in LHB. I know the original and it’s not in there. Altho I haven’t smelled the 2011 iteration. Lys, I can answer your question for hedione and heliotropine when I get my sample. According to Fragrantica: “A vast variety of natural and synthetic notes that give the feel of either retro face powder or of talcum powder dryness. Most usual powder notes are iris/orris, violet, vanilla, rose, some musks, heliotrope, oppoponax resin and some amber-oakmoss effects.” In Kenzo Flower, I believe it’s a combo of violet, rose, vanilla, and musk. In LHB, I think it’s more iris and heliotrope that do it. Hi Elisa, thanks! I’m sure it’s some combination – it’s not iris or natural heliotrope as I know it, although I’m starting to think it’s an accord that’s substituting here for true heliotrope. I also don’t think it’s a resin. It’s not in L’Heure Bleue (which I like) – it’s a **different idea of powder that’s very specific to very current scents and that I find objectionable**. And of course, since I do not like it, I kind of want to know what it is! I find it overpowering in L’HdN, especially in the top. I’m sure it’s inclusion in conjunction with white musks isn’t helping, although I didn’t find L’HdN a huge white musk offender. I just tried L’HDN last night. To me it smelled a lot like the original LHB, but I’m not an LHB aficionado. If it’s a metallic/salty/milky element that bothers you, that could definitely be helional. Maybe it just bothers you more in the powdery context, for some reason? Lovely review Angela but ooh this is so far from what I’d imagine in a fragrance with this name and bottle. Is this the night hour of an adult woman enjoying the darkness and its magic, or the night hour of a child with a sweet tooth? Yes, the teenager’s midnight snack might be just it! But that’s not completely fair, either–anything that hints of L’Heure Bleue must have some style to it, and L’Heure de Nuit does, but it’s sure no L’H B. Great review, Angela. I love L’Heure Bleue and Sacrebleu very, very much. I still want to try this one too (the blue juice in the bee bottle! ), but I’m pretty sure the laundry musk will put me off. Thank’s for the info! I’ll order a 0.5 ml sample and spend my bucks on a new Rose Nacrée decant! It’s always good to have a back-up plan, and with Rose Nacrée you’re covered! I’d love to try L’Heure de Nuit but with its price and limited distribution, it’s unlikely that I will. I am attracted to L’Heure Bleue but haven’t totally managed to pull it off yet. It’s… I don’t know. Someday. Right now, Esprit d’Oscar is my “starter L’Heure Bleue.” And I got that for $30 at the discounters, not $270!! I really like Esprit d’Oscar. And what a fabulous price! I should see if I can chase down a bottle at that price. I feel better after your review about my inability to try L’Heure de Nuit. I don’t have a spare $270, I don’t live hear a Guerlain boutique, I have enough clean musk in my life already, and I love and wear the original L’Heure Bleue EDP quite happily in the winter. Oh, and a colleague DID bring in home-baked biscuits this morning. But I’ll take your advice and try Sacrebleu. I’ve just re-read your review. Sounds great. It sounds like you are happily settled with both perfume and baked goods! If you do try Sacrebleu, I’d love to know what you think of it. I think you’ll love Sacrebleu! Very nice review, and I really agree with your assessment. This is much, much sunnier than its name would lead you to expect. It reminds me of a sunny summer morning, where the washing’s already on the line and a jug of cold lemonade sits next to you. L’Heure d’un matin d’ete? Is this another case of light is the new noir? I love the original L’Heure Bleue, but I also love L’Heure de Nuit, though their moods are very different. And you know, I’m guessing they’re aiming for a difference audience than for, say, La Petite Robe Noire. There are some tart florals in it that makes me think they wanted to appeal to people whose olfactory preferences were shaped in the 80s/90s. Or perhaps someone (like me) who’s tired of all the sweet SWEET SWEET fruity frags on the market. The L’Heure Bleue signature already puts L’Heure de Nuit out of the La Petite Robe Noire territory. It’s so particular. I’d love to see what (if anything) the marketing people ginned up about the target group. When you say that TW “bumped back its time a few hours”, do you mean towards noon or towards midnight? The times on the three original bottles in the lavish four bottle set are 5 AM (Dawn), noon, and 8 PM (Sunset). If I understand your meaning, it’s that the new LDN is before LHB’s time of twilight. The EDP in the set is for noon. As you can see, I’m a bit confused. I didn’t know there was a four-bottle set with different bottles intended for different times of the day. Are they all different takes on L’Heure Bleue? In my review, when I wrote “bumped back,” I meant moved closer to midnight. I was thinking of the name L’Heure de Nuit. But of course the fragrance smells more sunny and cheerful than full-on night to me. Celestia, you’re right, L’Heure de Nuit is Le Zenith from the coffret. Makes no sense, right? Lys: Thanks for your confirmation that I’m not alone in my befuddlement. Angela: Thank you for the clarification. The set for the 100th anniversary of LHB consists of four 30 ml flacons. Along with a bottle of the original LHB, are three reinterpretations representing three times of day in EDT, EDP and Parfum concentrations. So LHDN is the noon concentration but it’s name evokes a time after LHB. No wonder it’s so confusing! Why couldn’t they simply have named it L’Heure de l’Apres-midi or something like that? Now THAT would have been the perfect solution! It’s so unlikely that I would like this, but you never know. I tried a Idylle Eau Sublime only because I received a free sample with another purchase, and really love that beautiful dewey rose. Idylle Eau Sublime was less than a third the price of this one, though (and it’s even less now at the discounters). nozknoz – I got a sample of Idylle EDP and it was destined to rot in my sample pile until I read your comment above. Have you tried this? How does it compare with Idylle Eau Sublime? I haven’t tried it, hajusuuri, but according to Robin’s review here on NST and Victoria’s on Bois de Jasmin, it also sounds very pretty and wearable, not a sillage monster. One can’t wear challenging, complex perfume every day, can one? I think I first tried Idylle Eau Sublime around this time of year, after I’d been marinating in amber, incense, patch and all my dark vintage favs for a good two or three months and was ready for a softer floral. Why not? It’s always nice to be surprised by something you don’t have much hope for. I’m glad that sample worked out–and at such a good price! Nice review, although Eau de Laundry does not sound appealing at all. I am having such a lovefest with Guerlain lately that this one may scare me off Guerlains for a while. To me the musk jars with the rest of the fragrance, although some people might find that it makes it more clean and refreshing. But there are still so many great Guerlains out there! Sounds like an intriguing fragrance.